Water stagnated near Lumbini Park, Tarnaka junction, Begumpet, Masab Tank, Taj Banjara Hotel at Banjara Hills and Mehdipatnam, causing traffic jams. 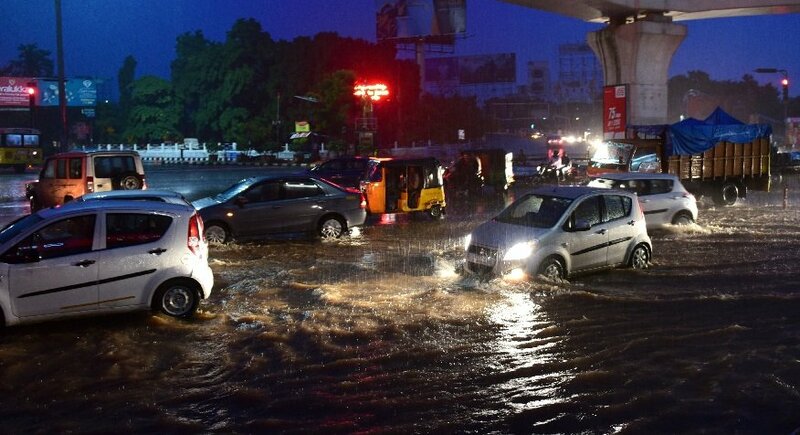 Hyderabad: Heavy downpour in the city late on Monday led to a flood-like situation in many places, choking traffic and inundating low-lying areas. The city has been witnessing intermittent rains over the last one week, keeping the weather comfortable over the city. However, the heavy downpour on Monday evening accompanied by strong winds disrupted traffic in most parts of the city. According to the Indian Meteorological Department, more rains were expected in the next 24 hours in the city. Rajendranagar mandal in Ranga Reddy district received maximum rainfall of 83.8 mm rainfall as per the reports received late on Monday evening while the Begumpet observatory in the city recorded 47.5 mm. Waterlogging at several places prompted GHMC teams to swing into action with the civic body asking its officials to be on the field for emergency operations in view of the heavy rain anticipated. Water stagnated near Lumbini Park, Tarnaka junction, Begumpet, Masab Tank, Taj Banjara Hotel at Banjara Hills and Mehdipatnam, causing traffic jams. According to Skymet Weather, these spells of rains could be attributed to a trough extending from East Bihar up to Coastal Karnataka across Odisha and Rayalaseema region of Andhra Pradesh. 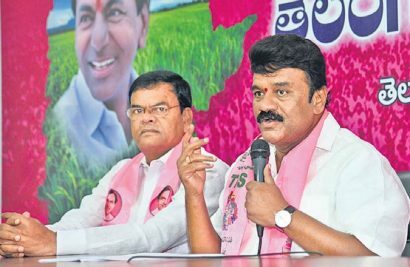 Hyderabad: The GHMC has arranged for 1,000 food packets to be supplied to people stranded in low-lying areas on Monday night and another 5,000 food packets are being arranged to be supplied on Tuesday depending on the requirement. Hyderabad: A majority of regions in Old City on Monday experienced power black outs during the heavy downpour that battered Hyderabad. 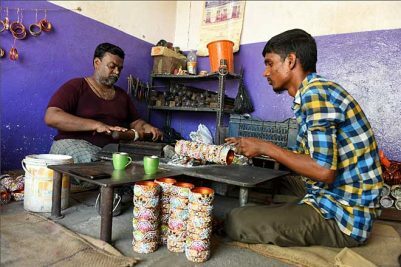 The regions where massive power cuts were reported, include Asmangadh, Charminar, Begum Bazaar, Attapur, Rajendranagar and Ibrahimpatnam. Tree branches falling on the electricity power lines during rains were the main reasons for the power outages, Electricity Department officials said. Hyderabad: The Hyderabad district administration has set up a control room at the Collectorate office to help the people affected with the heavy rain that lashed the city on Monday. Two officials would be available at the control room (040-2320 2113) to receive calls from the people. The officials would be available for the next 24 hours. In a related development, the Electricity Department officials deployed teams to remove trees that were uprooted due to heavy downpour. Power supply has been restored within 10 minutes after disruption in supply, officials claimed. People can call 1912, 94408 16340 in case of any disruption in power supply.